HEIDENHAIN angle encoder modules with ETEL integrated torque motor provide drive, control and measurement with very high accuracy in one compact system. With its angle encoder modules named the MRP series, HEIDENHAIN has already given manufacturers of high-precision rotary axes enormous support in their design, assembly and alignment tasks. The integration of a torque motor with a very low detent torque is now the logical step forward in this solution. This unique combination, named the SRP series, enables extraordinarily smooth motion control for high-precision positioning and measuring tasks. A high-precision rotary axis is an extremely complex construction. It is therefore better and simpler for a machine manufacturer to implement a highly integrated assembly with tested and specified properties instead of numerous separate components. This is the underlying principle of the HEIDENHAIN MRP angle encoder modules. They are characterized by their high degree of measuring accuracy and a bearing with very high guideway accuracy and high rigidity. The low and consistent moment of friction permits steady rotary motion. The combination of an angle encoder module and a special torque motor is now the next logical step. This torque motor with its very low detent torque enables extraordinarily smooth motion control. Neither disruptive detent torques nor radial forces impair the high guideway accuracy of the bearing. 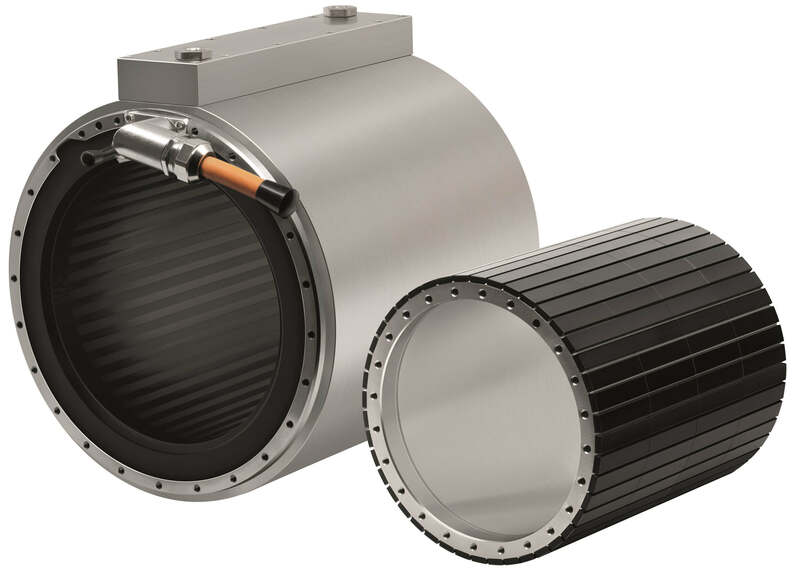 By combining the angle encoder module and motor components HEIDENHAIN has developed a particularly compact system called the SRP series with a low overall height and high rigidity. It is precisely the great rigidity of all the components that maintains the high accuracy even under changing loads. 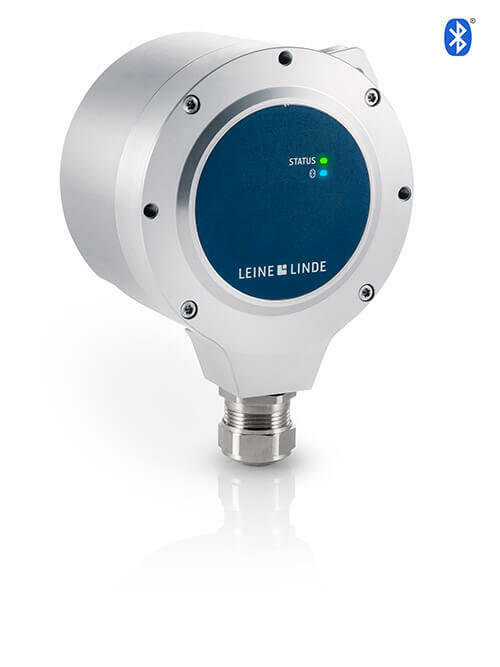 The angle encoder modules with drive motor significantly reduce installation and calibration times. In the place of numerous individual components is a highly integrated assembly with tested and specified properties. Simple mechanical interfaces eliminate all critical mounting processes. The elaborate matching of all individual components to each other as well as to the machine environment is no longer necessary, nor is time-consuming testing. At the same time, it is ensured that the specified accuracy is attained in the application. The new angle encoder modules with integrated drive motor are optimized in particular for the exacting requirements of metrology applications. Their most important features are very high resolution and excellent repeatability, even when operating temperatures vary. High motor torque is generally not of great importance here. Customer-specific modifications are possible for perfect adaptation to individual requirements. Because HEIDENHAIN manufactures the bearings, the encoders, and the ETEL torque motors, the functional components of the angle encoder modules with drive motor are precisely matched. The rolling bearings have been developed in-house and excel greatly when compared with conventional bearings. They are specifically adapted to the requirements of high-precision rotary axes. Furthermore, importance was placed on the most compact dimensions and the lowest mass possible. High speeds and very high load ratings are not of primary importance here. 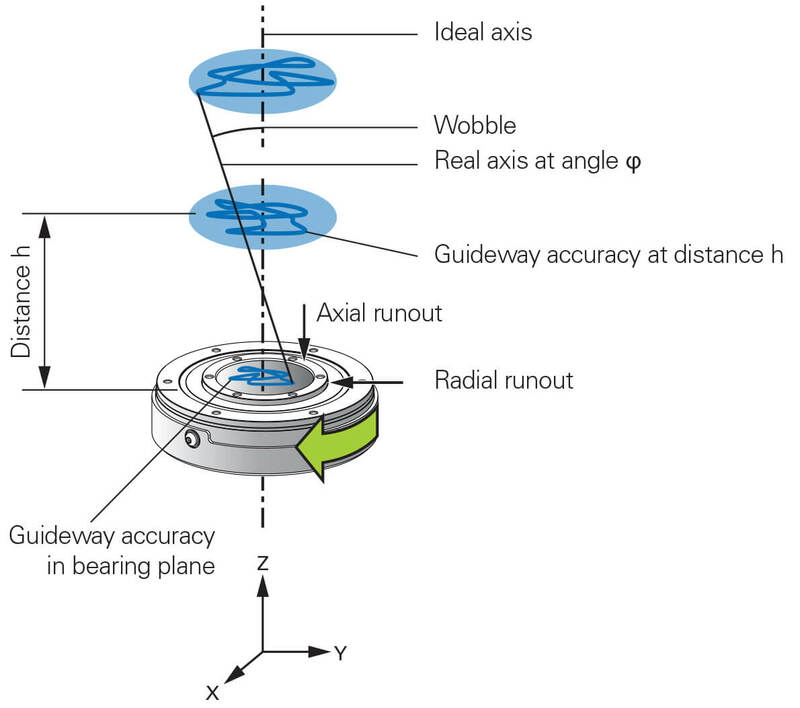 Simplified representation of decisive measurands and measured locations for the guideway accuracy of a precision bearing. HEIDENHAIN developed a special procedure to assess the bearing accuracy. It evaluates the actual guideway accuracy of the bearing, i.e. the deviation between the actual rotary axis and the ideal nominal rotary axis. Therefore, the radial and axial guideway accuracy is specified, as well as the wobble. As before, a distinction is made between reproducible and nonreproducible error. Available with both absolute and incremental measuring technology, the encoders have a high line count and are outstanding in their very small interpolation error, low positioning noise and very good drift stability. A so-called slotless ETEL torque motor is responsible for the drive. It combines the seemingly contradictory properties of a high torque density and a low detent torque. This is due to the special symmetrical construction with a modal coil. It is thus possible to do without the slots required by classic windings. Instead, an air gap winding is used whereby the rotor is de-energized and faces a constant magnetic field over the complete rotation. The result is that this motor has no detent torque and the angle encoder module with this drive enables extraordinarily smooth motion. The sophisticated arrangement of the main components means that noise has only a very slight effect on control and measuring accuracy. It also permits very compact dimensions and a large hollow shaft for the SRP series. AccurET controllers from ETEL are the perfect match for the SRP angle encoder modules with drive motor. They enable top performance in dynamics and position stability.